Malvina Thompson, nicknamed "Tommy" by a young Anna Roosevelt, was ER's trusted assistant, secretary, traveling companion, gatekeeper, and dear friend. As ER recalled in her autobiography, "she wanted to be useful and in many, many ways she not only made my life easier but gave me a reason for living." Born in New York City in 1893, Thompson, a "young, tart, shy blend of New England and the Bronx," graduated high school and taught herself secretarial skills. In 1922, after five years with the wartime American Red Cross, Thompson joined the staff of the New York State Democratic Committee, where, working part-time, she helped ER generate a solid women's turnout for Al Smith's 1928 presidential campaign. The two women learned their crafts together: ER did not know how to dictate and Thompson did not know how to take shorthand. They quickly adjusted to each other's styles and developed such an easy working relationship that once the Smith campaign ended and Thompson began working for Louis Howe full-time, she continued to work for ER part-time. By the time they moved to the White House, the two women had built an amazing partnership and friendship. Thompson's irreverent, humorous assessment of people and events complemented ER's earnestness and she could make ER laugh as few others could. She was also one of the few who would say "no" to "Mrs. R." (Thompson refused to call ER "Eleanor" despite ER's request that she do so.) A shrewd judge of character, she counterbalanced ER's soft heart, often challenging ER to reject a suspicious appeal or refusing to take dictation when ER responded in a way that would leave her vulnerable to those who sought to exploit her generosity. Utterly devoted to ER, whom she called "just about the biggest person in the world," Thompson organized her life around her boss. She refused all invitations for parties and dates during her stay in the White House because "you are always expected to pay so such favors in someway" and " if she lost her job tomorrow, those people" would not "offer her a room" in their home. As ER's key aide, Thompson traveled with ER (often averaging 40,000 miles a year during the early White House years), helped organize her correspondence, typed countless "My Day" columns, often juggling her portable typewriter on her knees as she traveled by car, plane, boat, or train, and managed ER's frenetic schedule. She monitored ER's press conferences, critiqued her responses, and recorded key points ER made when she delivered an extemporaneous speech. "Her standards were high for me, as well as for herself," ER recalled, "and she could be a real critic." Her efficient, no-nonsense approach to her work drew praise from FDR's staff, who frequently sent messages through Thompson they were afraid to deliver in person. Working for ER was a demanding job and Thompson's devotion touched ER deeply. In 1938, when Thompson was rushed to the hospital, ER cancelled all her engagements (in and out of the White House) to be at her friend's side during her hospitalization. Later that year, when ER had the Val-Kill furniture factory converted into her home, she had two bedrooms, a living room, a kitchen and a screened-in porch designed for Thompson's use. In their twenty-five year friendship, they shared holidays, family celebrations, private moments of elation and exhaustion, and trust. "Tommy" Thompson died April 12, 1953, eight years to the day after FDR, from a brain hemorrhage (like FDR), after a 12 day hospitalization. ER had rushed to the hospital from Hyde Park, where she was coordinating the wreath-laying ceremony on FDR's grave. She reached her friend's side right before her final convulsion. ER was devastated; as she later wrote "when she died, I learned for the first time what being alone was like." Asbell, Bernard. 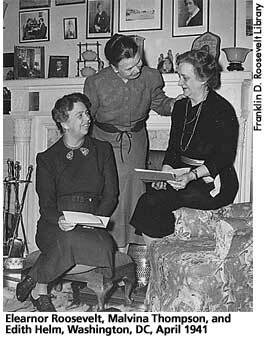 Mother and Daughter: The Letters of Eleanor and Anna Roosevelt. New York: Fromm International Publishing, 1982, 298-299. Lash, Joseph P. Eleanor and Franklin. New York: Signet Press, 1971, 315, 480. Lash, Joseph P. Eleanor: The Years Alone. New York: W. W. Norton & Company, 1972, 237. Roosevelt, Eleanor. "My Day," April 14, 1953. Roosevelt, Eleanor. On My Own. New York: Harper & Brothers, 1958, 107. Roosevelt, Eleanor. You Learn By Living. New York: Harper & Brothers, 1960, 85.